New home sales for the 21st century. solution for new residential construction. Selling homes is hard. Daypack makes it easier. Complete deals using any device, anywhere and at anytime. From real-time availability, to preparing worksheets, to generating and executing agreements, Daypack does it all. Daypack streamlines the sales process allowing you to prepare deals in minutes. Learn more. With Daypack, nothing requires installation. It is always accessible and secure. Learn more. "We love the platform and all its capabilities! The ability to auto-generate sales agreements saves us a ton of time." Kassaundra Dobson, Blue Elephant Realty Inc.
Access your sales matrix or site plan from any tablet or computer. Ensure your team has easy access to real time availability and detailed unit info at all times. View sales in real time and ensure units and additional items are never over sold. Effortlessly move units from available to conditional and let Daypack inform you when deals go firm. Generate and download detailed reports about your development with a single click. 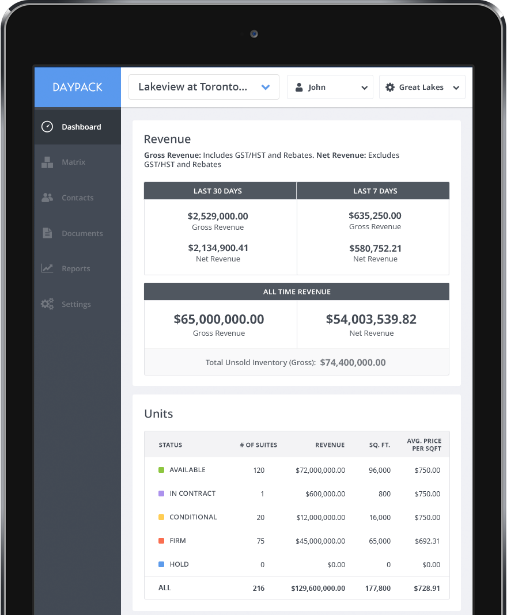 Daypack produces tax and revenue reports, amendment reports, deposit reports and many more. Prepare deals quickly by automatically generating APS documents. Eliminate errors and messy handwriting by having Daypack prepare all signing documents. Enter worksheets simply and seamlessly. Add multiple worksheets to a single unit, move worksheets between units, and capture purchaser info correctly. View a robust sales and inventory snapshot of your development, that is always up to date. Get key data points such as gross vs net revenue, rescission rate, and much more. Market your home listings across the web. Daypack can generate a digital feed of your homes so that you can provide websites, including your own, with real time listings. Sell your homes online with BuyNow. Let purchasers complete deals from anywhere and at anytime without having to visit your sales center. Keep track of what you care about. Equipped with fully customizable fields, Daypack adapts to you. Use our API to integrate with your other systems and make Daypack your own. Easy to learn and easy to use. Train your team in minutes, make updates and changes yourself, or work with our customer success team. Daypack is built for humans. Schedule a live online demo now.